Platforms are essential to business model innovation in all companies today, from startups to tech giants and large enterprises. Platform Hunt is an open initiative turning the art of building a platform into science. We studied 160+ platform businesses and discovered 8 distinct types of platform business models. These 8 platform types have different platform mechanics, including how they create network effects, types of players and their interactions, approaches to solving the “chicken and egg” problem, openness, growth dynamics, subsidies, competitive strategies and monetisation methods. Here is a summary of the 8 platform business models together with examples of platforms for each of the platform types. See Platform-Hunt.com for more details. Spread the word on Twitter, Facebook and LinkedIn and help more people to better understand the mechanics of platform business models! 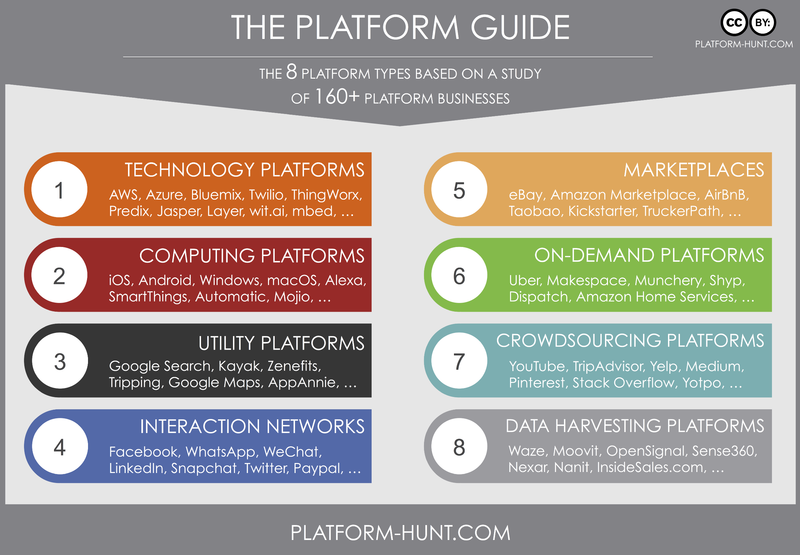 The definitive guide to platform business models based on a study of 160+ platform businesses.